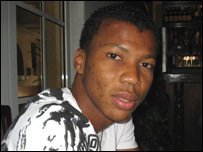 Spanish side Getafe have signed Nigerian striker Ikechukwu Uche from La Liga rivals Recreativo Huelva. The 23-year-old signed a three-year deal for an undisclosed fee. "It's another chapter in my career and I look forward to the challenge," Uche told BBC Sport on Wednesday. "I've had a wonderful time with Recreativo and the club will always have a special place in my heart." Despite reports linking him with a move to Deportivo La Coruna, Real Mallorca and Osasuna, Getafe were the only side to have met Recreativo's financial demands. Uche who has been in Spanish football since 2001, offered his gratitude to Recreativo for allowing him to complete his move. "I had a family atmosphere there and wish the club all the best," Uche said. "I'll never forget the players, the management and the fans for their wonderful support." "It's a big opportunity for me to be joining Getafe, it is a team that showed they wanted me more and they also play football just the way I like it." Uche scored 21 goals in the 2005/06 season to help Recreativo regain promotion to the top division. The Nigerian missed the start of last season because of injury but managed to score eight goals in 30 appearances for Recreativo, which is the oldest club in Spanish football. "It gives me great fulfilment to play for the oldest club in the country and leave such a great mark," the striker added. "I think now is the time to start chasing those dreams I've always had, which is to win trophies and I think I have joined an ambitious club in Getafe."